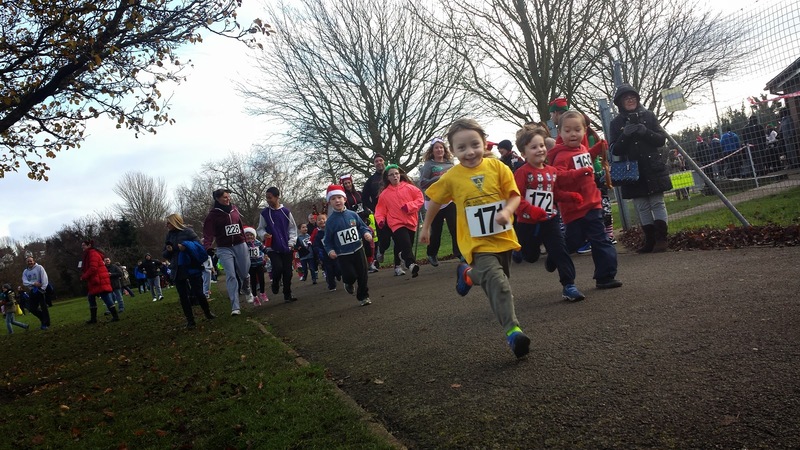 The Dartford Harriers Xmas Dash and Kids’ Fun Run 2014 was the second running of this festive event through Central Park in Dartford. I had picked up a couple of entry forms quite a way in advance of the event but only filled them out and registered on the day, which really was the easiest way to enter the event. 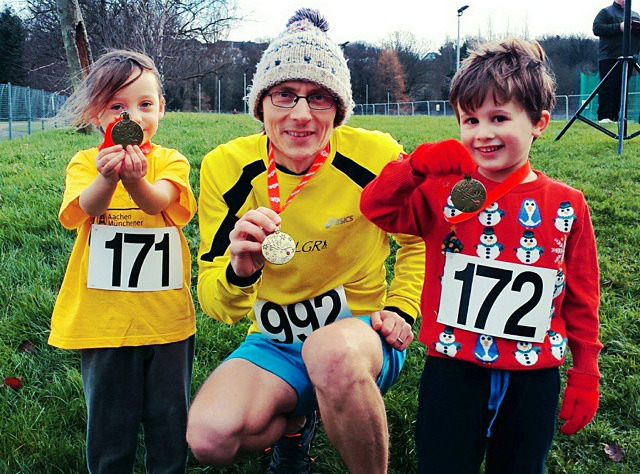 We had pre-arranged with our friend that we would take her son with us and he and my daughter could run the fun run together, just like they do when they go to Gravesend junior parkrun. The race HQ is in the Dartford Harriers clubhouse at the southern end of Central Park, which is also the HQ for Dartford parkrun, and upon arrival it made a pleasant change not to have to worry about course set up, volunteers, and everything else that goes with staging an event. I had arrived with plenty of time to spare and spent it chatting away to SLGR and Dartford Harriers team mates, as well as some other friends from other clubs around the local area. 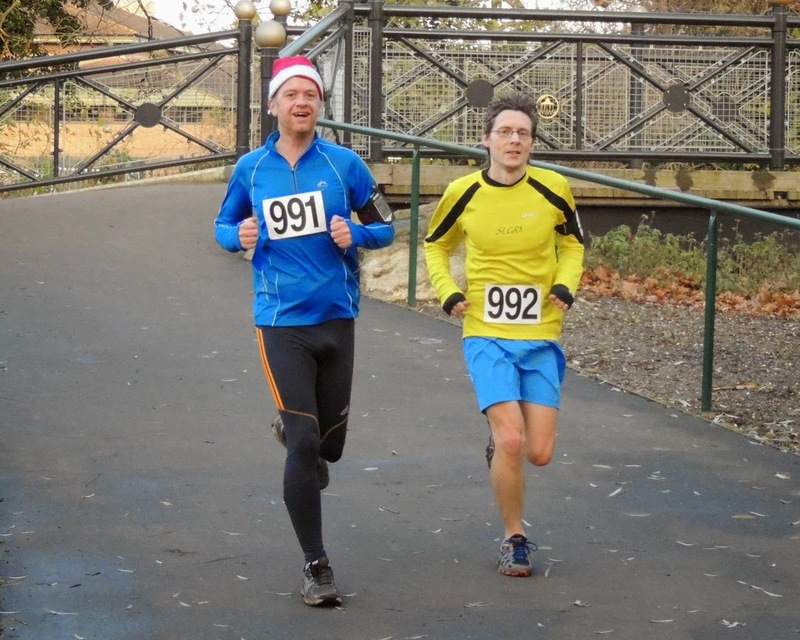 The route for the 5k Xmas Dash was 3 clockwise laps around the main body of Central Park – mostly on tarmac, but a short section was on the grass. It made a change running around the park in the opposite direction to that of the weekly parkrun and following my heavy legs from the previous day’s run, I had decided to just have an easy jog around the park – after all, there was no chip timing and the times and positions were not recorded at all. 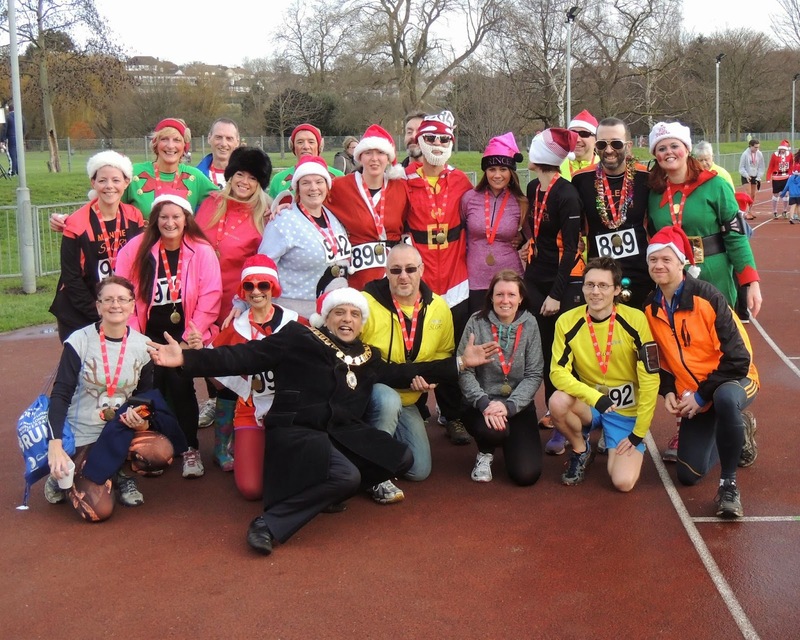 This was essentially a Christmas fun run with no pressure to push the pace – just as it should be! In the start funnel, I lined up next to SLGR team mates Dawn and Richey and we stayed together for the whole of the first lap, even posing for a photo when we saw our club chairman with his camera as we approached the end of the first lap. After this we ended up separated from Dawn, but we continued our way around the course for the next two laps until we had the idea to put in a proper effort on one of the Strava segments on the course. We were briefly separated during our all-out efforts on the 300 metre out-and-back Strava segment, but we were soon reunited and after taking a quick detour around the back of the Dartford Harriers clubhouse, we finished and were presented with our festive medals by the Mayor of Dartford – Cllr. Avtar Sandhu MBE. There was a great turnout of So Let’s Go Running runners and after rounding them all up we managed to have a great team photo taken with the Mayor before it was time for the kids to have their turn at running. The original kids' fun run course was supposed to be up to 4 laps around the track (with each child free to decide when they had had enough), but as the track is currently undergoing refurbishment work, this was changed to a loop (or two) on the tarmac paths around the edge of the main grass area in the park. My daughter and her friend took part and had a great time, and were thrilled when they also received their festive medals. We managed to get a quick snap of the three of us with our medals before returning to the clubhouse to warm up. It was a fun, family event and definitely one to add to your family's pre-christmas calendar!